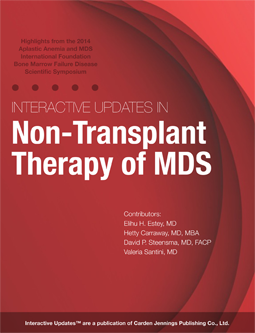 Currently there are limited options for MDS patients that are failing hypomethylating therapy. Work is still to be done on optimizing the delivery of hypomethylating therapies by dosing appropriately, sequencing appropriately, and using thoughtful combinations. There is also a need to improve drug formulations, whether it is an oral formulation or a novel formulation, in selecting patients for directed therapy. Hopefully with improvement of a better understanding of the mechanisms of resistance, or even mechanisms of actions with available agents, drug targeting in patients with MDS will improve. Lecture on MDS vs. AML: How Different? For CME questions, please E-mail: info@mer.org. If you wish to receive acknowledgment of participation for this activity, please complete the post-test by selecting the best answer to each question. Complete this test and mail to Medical Education Resources, 9785 South Maroon Circle, Suite 100, Englewood, CO 80112; or fax to 303-798-5731. Click here for CME Post-Test.